An Apartment which features a living area with satellite flat-screen TV, a sofa and kitchenette. The private bathroom has a shower. Studio Apartment have balconies overlooking the pool and offer a beautiful panoramic side sea view of the small and popular bay of Qawra. These consist of a spacious room which includes a kitchenette with fridge, microwave or oven, kitchen utensils, crockery and cutlery, shower room and two single beds. 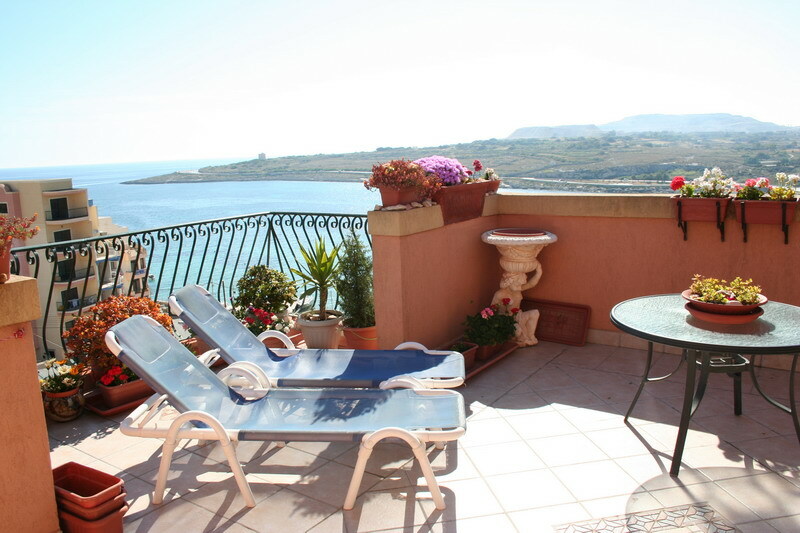 One Bedroom Apartments have inland view balconies and consist of a separate 1 spacious bedroom with inland view terrace/window and shower room. 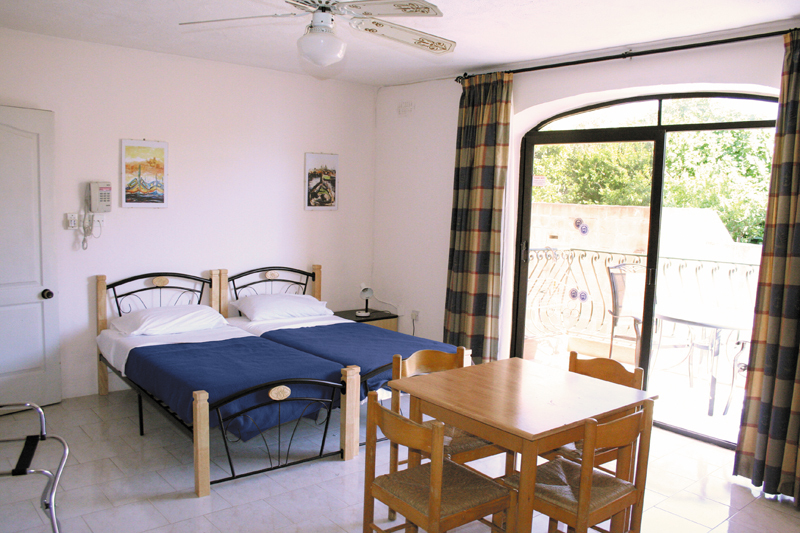 They also comprise kitchen/living room with sofa bed for 1 or 2 persons. 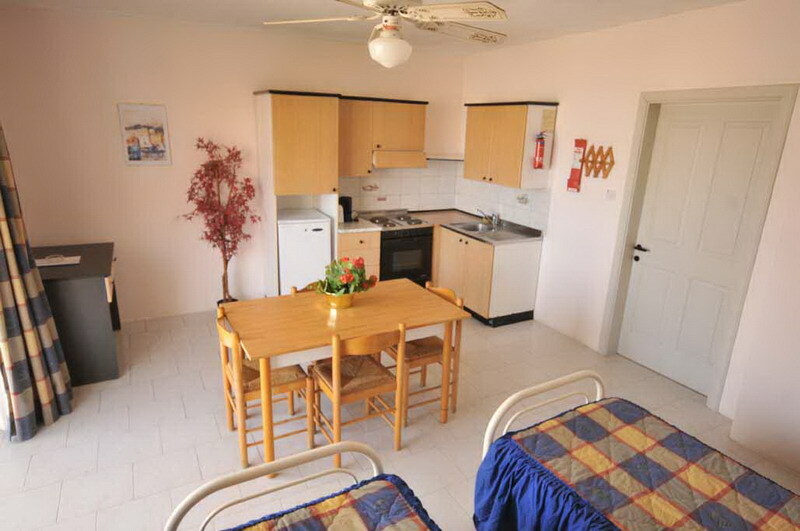 The kitchen is equipped with fridge, microwave or oven, kitchen utensils, crockery and cutlery. 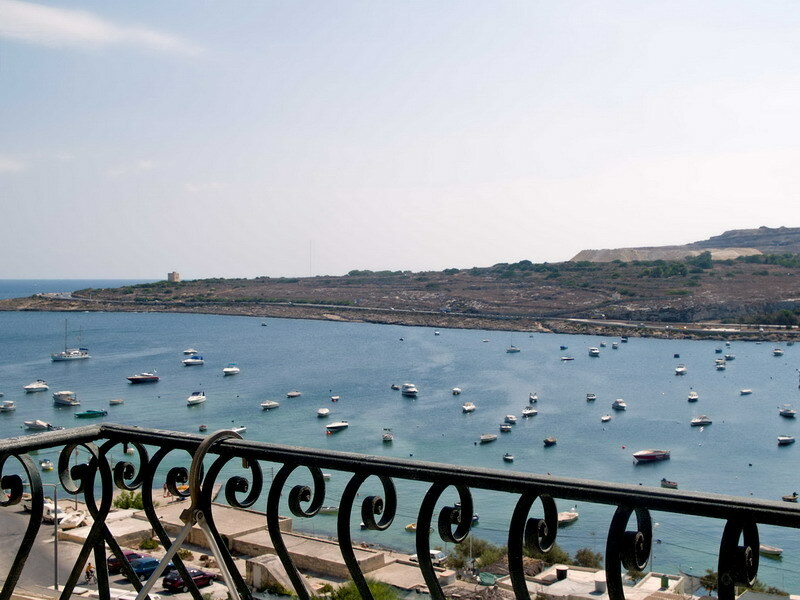 Two Bedroom Apartments have balconies overlooking the pool and offer a beautiful panoramic side sea view of the small and popular bay of Qawra. 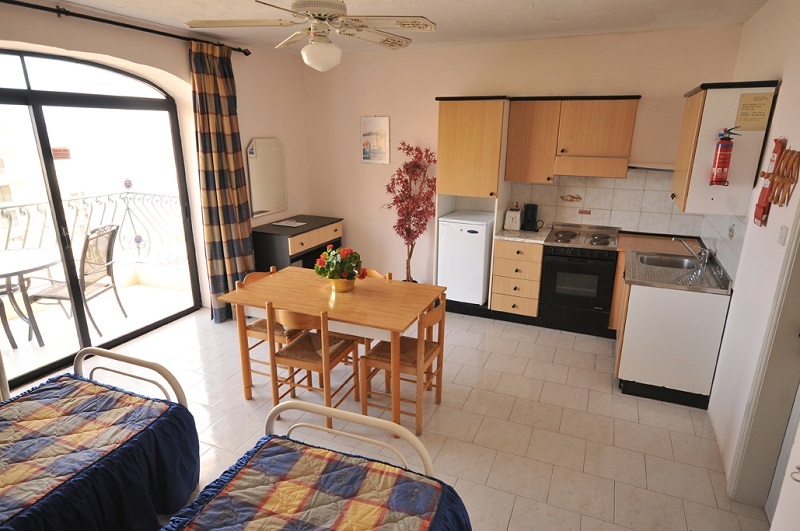 They also comprise kitchen/living room with sofa bed for 1 or 2 persons. The kitchen is equipped with fridge, microwave or oven, kitchen utensils, crockery and cutlery. Both bedrooms have inland view terrace/window and shower room. One Bedroom Penthouses have large terraces with sun loungers and dining area overlooking the pool and offer a beautiful panoramic view of the small and popular bay of Qawra. These consist of a spacious kitchen with fridge, microwave or oven, kitchen utensils, crockery and cutlery and washing machine. The sitting/living room is also equipped with a sofa bed for 2 persons, 1 spacious double bedroom with inland view terrace/window and shower room. These are general policies for White Dolphin Holiday Complex. As they may vary per room type, kindly also check the room description. Flexible Bookings - Take advantage of our best unrestricted publicly available rate; It allows you to change or cancel your reservation without worry if your plans change up to 1 day prior to arrival. Cancellations 1 day prior to arrival 1st night will be charged. No shows 3 nights will be charged. We reserve the right to cancel or modify reservations where it appears that a customer has engaged in fraudulent or inappropriate activity or under other circumstances where it appears that the reservation contain or resulted from a mistake or error. Advance Purchase Bookings - If you cancel your reservation for any reason, attempt to modify reservation or you do not arrive on your specified check-in date, your payment is non-refundable. Should for any reason depart early you will not recieve any credit or refund. If you wish to extend your stay a new reservation is required for the additional date(s), subject to availability and prevailing rates, and this rate may not apply. Any type of extra bed or babycot is upon request and needs to be confirmed by the hotel. Kindly send us an e-mail on info@whitedolphinmalta.com to request.